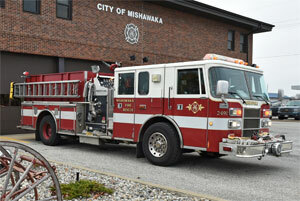 The Mishawaka Fire Department and its members have been serving the City since 1904. The primary responsibilities of the Fire Department lie in the areas of: Fire Suppression, Fire Prevention, Fire Investigation, Emergency Medical, Hazardous Materials, Education, Water Rescue and Technical Rescue. The minimum manning is 29 persons, 24 hours a day, 365 days a year. Mishawaka's continued healthy growth means more work for all City departments. The general upward trend in the number of fire department responses increased last year to a new high of 7,432. 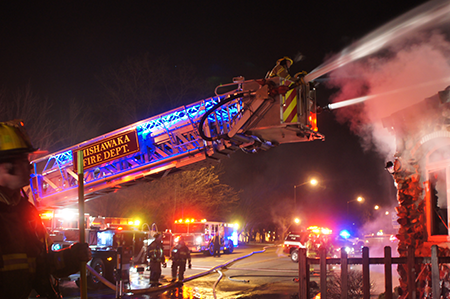 Mishawaka firefighters continue to meet the challenge with better training, better facilities and better equipment. Increasing numbers of responses (77%) are medical assistance calls, not fire-related runs. That statistic alone illustrates the wisdom in merging the services of fire safety and EMS. More than half our firefighters are cross-trained as Emergency Medical Technicians. All fire vehicles carry oxygen, first aid equipment and semi-automatic defibrillators for cardiac emergencies. In addition to their other duties, Mishawaka firefighters continue an intensive fire prevention and fire safety education program. Last year over 5,100 people, mostly children, received fire safety education through "Survive Alive House", Little Red and various meetings and school assemblies. These efforts are helping control the number of unfriendly fires in Mishawaka, as well as reducing fire injuries, deaths and property damage. "The Fire Department provides an appropriate, safe and professional response to fire, medical and environmental emergencies. The department is dedicated to minimizing the loss of life and property through suppression, rescue, education, code enforcement, investigation and other programs."